Results of the program led by ADEME from 1995 "Automobile Particles". Physico-chemical characterization of the particles. Effectiveness of pollution control devices. Despite significant progress in limiting the release of pollutants from automobiles, due to regulations and technological advances, there remains a concern about the emission of certain pollutants such as nitrogen oxides and particulates, due the constant increase in traffic of passengers and goods. Indeed, Diesel, initially used almost exclusively for heavy vehicles, saw its employment grow very strongly for private vehicles during recent years. He currently represents 60% of sales and almost 50% of the fleet of private cars in France. This success is linked to the economic nature of the use of these engines (lower diesel fuel prices combined with volume consumption lower than that of petrol engines) and technological advances they have received in recent years. Recent solutions in place (high pressure direct injection, variable geometry turbocharger) have undoubtedly helped to increase the performance of these engines, while further reducing their inherent fuel consumption, pollutant emissions and their noise emissions. From an environmental point of view, the diesel engine is however penalized by particulate emissions it causes. The study and treatment of these solid compounds, visible exhaust and heavily criticized for their impact on air quality, the subject of numerous studies for characterization and development. The emitted particles become suspended in the air and can be inhaled and deposited at a point airway or be expired. The disposal site, or expiration probability depends on the particle properties, respiratory tract and respiratory system. Effects on short-term health occur at relatively low concentrations (less than 50 mcg / m3) and verify the medical level (consultations, emergency department). At higher concentrations, it is correlated with the presence of particles and the development of chronic bronchitis. As regards longer-term effects (cardiovascular effects, respiratory tract cancers), many appraisals were conducted by public health agencies of the industrialized countries (IARC, 1989; INERIS, 1993; HEI (Health Effects Institute ) 1995; French Society of Public Health (SFSP), 1996 ...). To date, mutagenic character of these combustion residues has been proven experimentally. But the carcinogenic effects of such emissions could not be demonstrated that for certain animal species and for concentrations of well above pollutants to those encountered in the environment. In humans, epidemiological studies in the workplace tend to show an increased incidence of lung carcinoma and bladder. Moreover, studies in the United States tend to show an increase in lung cancer risk associated with long-term exposure to particulate pollution in the air. Diesel particles have been classified as probable carcinogens by the International Agency for Research against Cancer. The growing interest in diesel engine for both freight vehicles than for passenger cars and the health impacts identified, incite to ask a number of important issues, including the relevance of regulations on emissions. 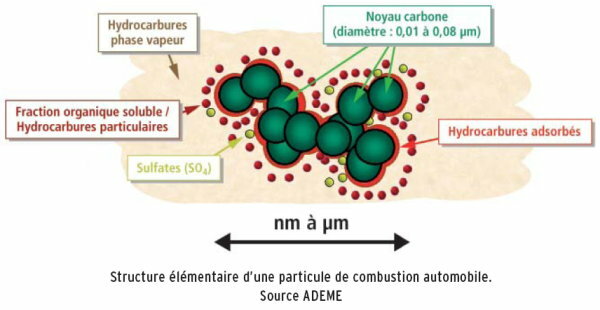 - The technical devices considered to face the tougher emissions standards will they not have more effective action on the larger particles heavier than the finer particles, thus putting into question the relevance of the current regulation covering the mass emissions? - What is the chemical composition of the emitted particles, are their hazardous compounds properly disposed by technical devices? To answer these questions, ADEME decide soon 1990, quantify the performance of a particulate filter (DPF). At that time, the first application is on a bus to take account of emissions in urban areas. However the technology is not mature, the results were not satisfactory. and secondly to identify the characteristics of responsible soot effects on health. This component is developed in the first part of the document. - A performance evaluation program in use on fleets, the first available systems. The evaluations concerned all road vehicles, buses, garbage trucks, heavy trucks, light vehicles. For each type of vehicles involved, all relevant systems is evaluated, both in actual use (held in time and efficiency) and laboratory for accurate and comparable data. This component is the subject of the second part of the document. - Discussion efficiency particulate filters?